Unfortunately, my brother Jon's trip out here was cut short a week due to some sudden work-related obligations that came up, so that resulted in his creation of a fairly whirlwind travel itinerary. He had a lot of places he wanted to see, which meant that after driving home Sunday from Podrecany and recovering from the previous day's partying, we set off for Budapest early Monday morning. Overall, I think they really enjoyed the city. I certainly dug getting to visit it for a second time, however briefly, and can't wait to go back. Jon and my dad definitely benefitted from my having already been there. Sadly, Terezia had to work and couldn't come down with us. I managed to rent a studio apartment for us that was right along the riverfront, a few doors down from the white Elisabeth Bridge. Not as great as the apartment Terezia and I stayed in last time, but it was fine, the building itself was incredibly nice, and the central location was pretty much unbeatable. It's also nice to visit Budapest to get more of that big-city, cosmopolitan feel, something Bratislava, as nice as it is, kind of lacks, partly due to its size. As we were making our way from the metro station to the apartment, we all noted how Budapest just felt like a real city. After arriving, we sauntered through Parisi Udvar and the old streets of Pest, then walked across the Chain Bridge to the Buda side, where I dragged Jon and my dad up the hill to the castle, Matyas cathedral, and the Fisherman's Bastion to take in the stunning views of the city. There were two things I definitely wanted to check out this time that Terezia and I weren't able to hit back in April: one of the "ruin pubs" in the Jewish quarter, and the Szechenyi thermal baths. After dinner on Raday Utca, we went to a "ruin pub" called Szimpla, which Rick Steves describes as being the best of several such pubs located in Budapest's Jewish quarter. Basically, these pubs exist in large, old, crumbly, formerly residential buildings that appear as if they are on the verge of being condemned. At Szimpla, you walk in off the street into a network of hallways that lead to the pub itself, which then branches off into several rooms, the most prominent one being the open-air courtyard in the center of the building. The walls were riddled with chunks of missing plaster, knife-scrawled messages, and an eclectic assortment of off-beat art and random found objects. Some of the seating was made out of small, old, communist-era cars that had been chopped in half. The place was bursting at the seems with visual stimuli. The lights were dim, and a series of old-timey black and white film footage was being projected on one wall, much of which looked like pre-1930s women's fashion shows. Several tables had hookahs. The crowd ranged from hip looking students to middle-aged yuppies. I didn't hear nearly as much English as I thought I would, but plenty of Hungarian and other languages. We tried some Hungarian beer that was suitably tasty. I would absolutely go back. Not my photo: Szimpla is sprawling, but here is a pic of one of its rooms. The next day, after going to the Great Market Hall to get some langos and wandering around the parliament building, we set off for the Szechenyi baths. These were built around the start of the 20th century (over an older thermal bath complex) in the city park. There are three outdoor pools: a lap pool, with cooler water; the "fun" pool, with 80 degree water and a fun loop in the center with a powerful jet-induced current; and the "relaxation" pool, with 100+ degree water and an appropriately mellower vibe. After 10 minutes in the "fun" pool, we decided to check out the warmer water of the "relaxation" pool, which was much nicer, and we floated around in its soothingly steamy water until we felt sufficiently relaxed and prune-like. The crowd was a blend of tourists in bikinis and pot-bellied locals in speedos. The entrance procedure was nearly as complicated as the travel guides make it out to be, but the experience was definitely worth it, and I would certainly return. 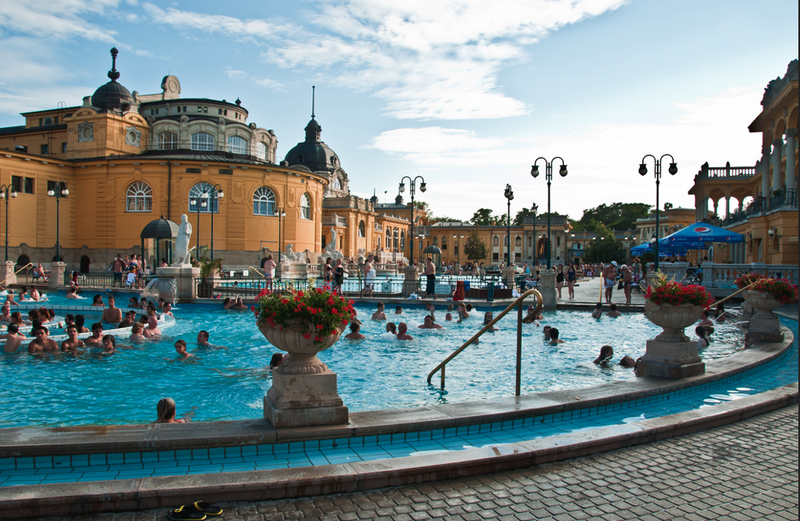 Not my photo, but this is what the Szechenyi baths look like. After another dinner on Raday Utca (this time at Cafe Intenzo, a place where Terezia and I ate back in April), and a rest-stop at the apartment, I took them to the train station where they caught the night train down to Belgrade in Serbia. 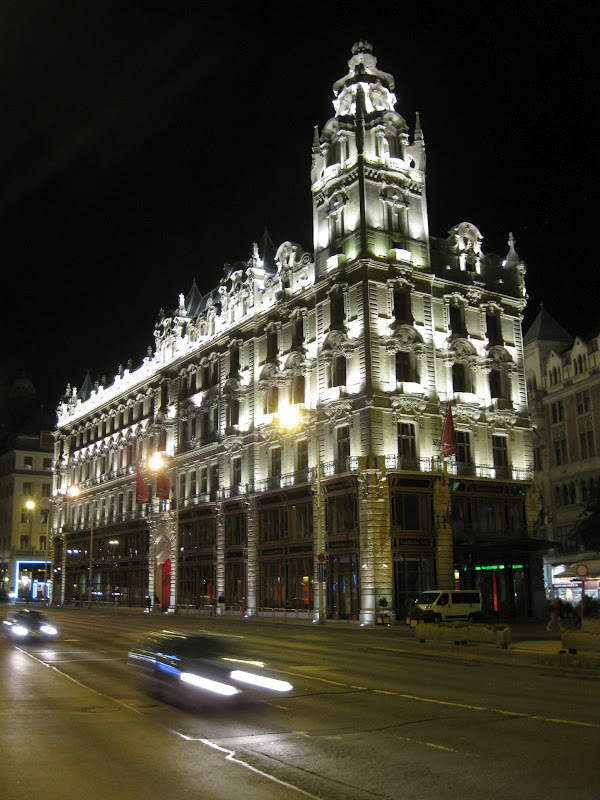 I tried to convince them to stay two nights in Budapest, but the night train was a good compromise that at least allowed them a couple days in the city (even though they still missed several areas, like Andrassy blvd.). I spent the second night there by myself and woke up early the next morning to get in another couple hours of exploring the city. Jon has a cousin named Vuk who lives in Belgrade, and my dad and Jon went to stay with him for the following two days, after which they headed down to the coast of Montenegro where Vuk's mother (Jon's aunt) owns a summer home. Jon polishing off a beer at Cafe Intenzo. Two weary travelers on their way to the night train to Belgrade who wish I'd just put the freakin' camera away. Budapest's totally groovy, vintage, Soviet-era Metro cars of lines 2 and 3. Click here to see more photos from this trip to Budapest! 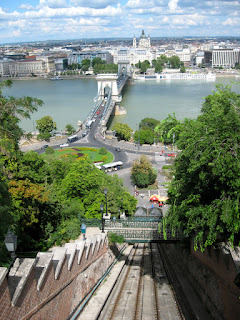 Click here to see photos from the previous trip to Budapest!